Brewery surcharges… Fees the sewer authority charges an industrial client above and beyond regular sewer fees. Sometimes they’re cheap, sometimes they’re expensive, sometimes they don’t exist at all. In the world of brewery wastewater, there are more nutrients/pollution/things to remove per gallon of wastewater as compared to typical household wastewater that most treatment plants were designed to treat. So this means they charge extra since there is more work to do at the treatment plant per gallon of water. This extra work primarily shows up in the electric bill. Removing nutrients involves aeration. Aeration is horsepower. The methodology used to calculate these numbers is very different for each town. Some are fairly simple, others are needlessly complex. Some towns have rates that change quarterly, others rarely change their rates. And remember, some towns don’t apply surcharges at all and others want you to dump as much spent yeast, trub, etc. as you can. These fee examples are current as of Nov 2014*. This is just a small selection of towns, but you can plainly see the importance of giving wastewater its due respect when planning, designing, and locating a brewery. 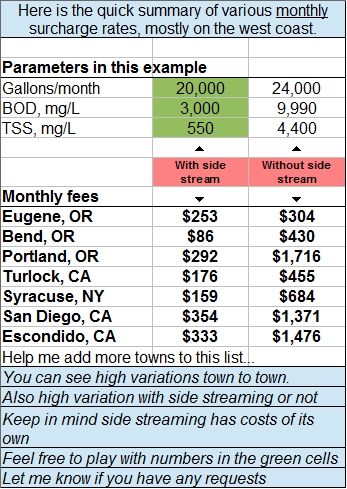 These are monthly fees for a very small brewery, all based on the same gallons, BOD, and TSS. I want to make this list bigger. Please send me examples or requests and I will gladly add them to this list. *The fees for Bend, OR are not current. At this time they are not applying surcharges. What’s shown above is how they used to do it. The City of Bend was never transparent with their methodology and after much wrangling on the part of breweries in town they stopped applying surcharges and actually refunded all of the surcharge money for several years. I think it’s safe to assume they will begin a surcharge program again and it will be much more expensive than it was.